Tigers Eye Video Slot Guide & Review - Casino Answers! Tiger’s Eye is a 5-reel, 40-line video slot developed by Microgaming, featuring a wild symbol, stacked wilds, scatter wins, multipliers, a free spins feature and a gamble feature. You can play the Tiger’s Eye video slot at Bovada. Coin sizes on the Tiger’s Eye slot machine are $0.01, $0.02 and $0.10. You can select from 1-40 paylines per spin on Tiger’s Eye and bet from 1-5 coins per line. The lowest total bet you can make on Tiger’s Eye is a penny per spin up to the highest total bet of $10 per spin. Tiger’s Eye has an ideal betting range for low stakes and casual slots players, rather than high rollers who wish to bet more than $10 on a spin. You can play the Tiger’s Eye slot game by hitting the “Spin” button or “Bet Max” button to play with all 5 coins and 40 paylines enabled. The highest paying symbol on Tiger’s Eye is the Tiger’s Eye logo. 5 of a Kind on a selected payline will pay out the 1000 coin top jackpot. The Tiger’s Eye symbol is wild and will substitute for all symbols except for the scatter symbol. The wild symbol is stacked on all reels, so that means that the symbol can cover all three positions on a reel. The scatter symbol on the Tiger’s Eye online slot is the Golden Tiger symbol. 2, 3, 4 or 5 Scattered Golden Tiger symbols will pay out 1X, 2X, 20X or 200X your total bet. 3 or more Golden Tiger scatter symbols will award you with 10 free spins with up to a 10X multiplier. On each free spin, the multiplier will increase by 1X. The free spins feature cannot be re-triggered. All bets and paylines on the free spins feature are the same as the game that triggered the free spins feature. You will win lots of free cash when you trigger the Tiger’s Eye free spins feature at Bovada. All wins pay left to right except for scatter wins (which pay any). All wins are multiplied by the bet per line, except for scatter wins. Only the highest win is paid per selected payline. All wins occur on active paylines only, except for scatter wins. Scatter wins are multiplied by the total bet and added to payline wins. Switch Tiger’s Eye into Expert to gain access to the autoplay mode. You can play 5, 10, 25, 50, 100, 250 or 500 autoplay spins. You can set it to stop once all spins are complete or if a win exceeds or equals $100, $500, $1000, $5000 or $9999. Autoplay will stop on any feature in the Tiger’s Eye slot game. You can stop autoplay on any time. 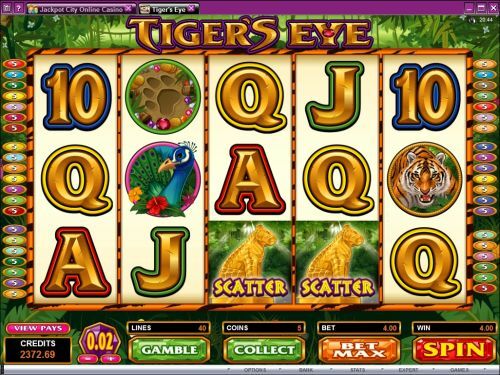 Tiger’s Eye is a solid video slot, offering a few special features. The negatives are that there is nothing special in the payout department and that the betting range is rather limited. You can play the Tiger’s Eye slot by signing up and depositing at Bovada. Can USA players play the Tiger’s Eye online slot for real money? American players are currently unable to play the Tiger’s Eye video slot at Bovada. 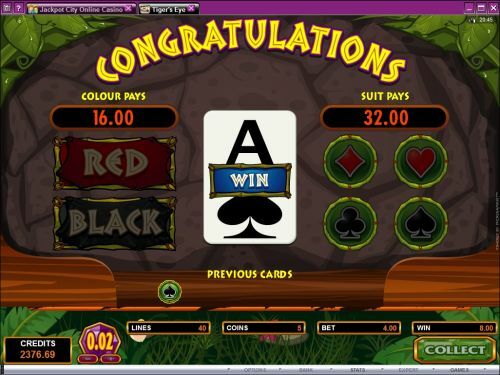 However, for an alternative, Americans can play the Tiger Treasures Video Slot at the USA-friendly Cherry Red Casino. For more info on Cherry Red Casino, you can read our Cherry Red Casino Review. Is there a Tiger’s Eye free Flash game that I can play? Due to its recent release, there isn’t a Flash game available of the Tiger’s Eye slot machine. Keep checking back at Bovada and hopefully they will have an Instant Play version of the Tiger’s Eye video slot very soon.